Nikon Z vs Nikon F - What's the Difference? Home » Cameras and Lenses » Nikon Z vs Nikon F – What’s the Difference? Nikon Z vs Nikon F – What’s the Difference? It has been almost 60 years since Nikon introduced the Nikon F mount on its first SLR film camera, the “Nikon F“. Since then, Nikon has made over 100 million lenses for this mount without changing any of the physical dimensions, primarily for the purpose of keeping lenses compatible between different cameras, whether film or digital. With its new full-frame mirrorless system, Nikon is now introducing a brand new “Nikon Z” mount, which is quite different when compared to the Nikon F mount. First, it is larger in its diameter, which offers a number of important benefits pointed out below. Second, due to a much shorter flange distance (thanks to lack of the mirror mechanism), it opens up many more opportunities for new types of lenses that we have never seen before. Note (08/31/2018): The above table has been updated with the throat diameter + inner diameter and the information has been corrected for the new Nikon Z mount. It turns out that the actual throat diameter of the Canon EF mount is actually 50.6mm, while the inner diameter is 54mm. This makes Nikon Z mount the largest full-frame mount on the market. As you can see, the new Nikon Z is larger in diameter than all other current 35mm mounts, whether DSLR or mirrorless. The Fujifilm G is the only medium format system in the above table, provided purely for comparison. While some rumors indicated that the Nikon Z mount is almost as large as the Fujifilm G, just looking at the size of the image sensor itself compared to the mount size shows that the Nikon Z mount is only designed to accommodate full-frame sensors – it will not be able to physically fit a medium format sensor. 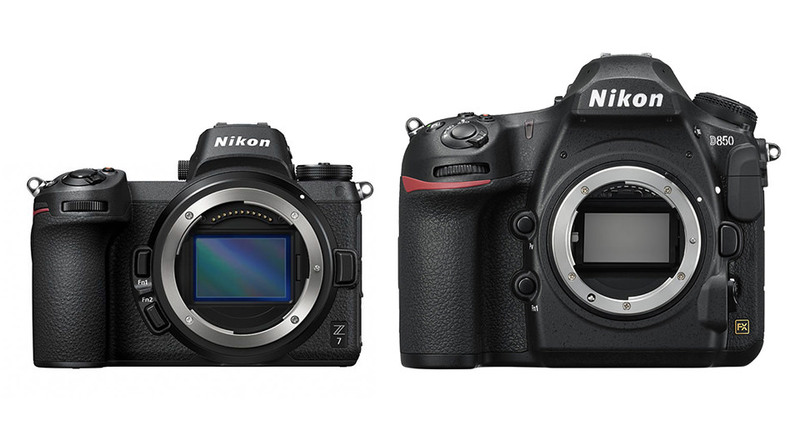 As you can see, while the new Nikon Z7 mirrorless camera is smaller in physical size when compared to the Nikon D850, its mount diameter is visibly larger. Nikon changed quite a few things with the new Z mount. There are now 4 screws to hold the mount instead of 5, and the number of lens contacts has increased from 8 to 11 as well. Interestingly, there are now a total of 4 metal ridges that hold the lens, which means that attached lenses should stay more securely on the Nikon Z compared to Nikon F. This is probably why Nikon also moved the mounting white dot up as well. So what are the benefits of the new Nikon Z mount? The larger mount opens up more opportunities when compared to the Nikon F. First of all, it provides more space for the sensor to move around when manufacturers add in-body image stabilization (IBIS). Since most mirrorless systems feature IBIS, it is good that Nikon future-proofed its mirrorless mount by making it larger. If there is more space for the sensor to move to, Nikon can implement a very complex IBIS system that not only compensates for camera shake, but also allows to implement such features as pixel shift and star tracking (something Pentax has already done on the K1 / K1 II). Second, a larger mount gives more flexibility to camera manufacturers when it comes to designing lenses, sometimes allowing simpler lenses to be designed at lower costs. At the same time, mount / throat diameter is not the only variable that impacts lens design – flange distance is also equally important. Shorter flange distance allows lenses to be placed closer to the sensor, which in itself allows lens manufacturers to start building simpler, smaller, lighter and less expensive short focus lenses instead of the retrofocus types. In addition, the throat diameter combined with flange distance determines the maximum possible angle of incidence of the marginal rays from the lens, which is important in designing lenses – generally, the larger the angle of incidence, the easier it is to make high-performance lenses. In the case of Nikon Z mount, that maximum angle of incidence is around 44.09°, which is a lot when compared to the Nikon F that is limited to 12.1°, or the Canon EF that is limited to 18.8°. Even Sony’s mirrorless E mount has a smaller angle of incidence at 31.6°. All this means that the Nikon Z mount, thanks to its large 52mm throat diameter, along with a very short flange distance of 16mm makes it the most versatile lens mount on the market today. One downside of a larger lens mount throat diameter is lens size and weight issues. The larger the throat diameter, the larger the lens has to be at its mount point, which obviously does impact its overall thickness and weight as well. Also, the shorter flange distance can lead to increased vignetting or discoloration in the corners of an image (although this can be mitigated by making the lens design longer to simulate a longer flange distance). Either way, Nikon made the right choice by going with a large enough mount that is not too taxing on lenses, but also is not so large as to increase the size and weight of each lens by too much. Considering that Nikon is aiming its mirrorless cameras to be compact and lightweight, it would not make sense to go for a much larger lens mount. Third, considering that the Nikon Z mount has the shortest flange distance, as well as a large 52mm throat diameter, it means that lenses from other DSLR and mirrorless systems could, in theory, be possible to mount on Nikon Z mirrorless cameras. If Nikon mirrorless takes off, we can expect to see third party lens options that will allow mounting lenses from Leica, Pentax and even Sony mirrorless to the Nikon Z mount. Interestingly, other manufacturers will not be able to adapt Nikon Z lenses to their systems! Lastly, if Nikon ever decides to go with a slightly larger sensor than 35mm, it will be able to do it with the current mount diameter. It will not be able to accommodate a medium format sensor, but perhaps a slightly larger sensor that will provide better low-light performance or increased resolution could be an option. In short, the Nikon Z mount is clearly superior to the Nikon F in a number of ways. As always, great article Nasim! First: good glass has its weight. Good glass comes with a size too. So small and lightweight is very relative. Second: the small XT1 body was a challenge for my big hands. It was very difficult to operate the camera “blindly” and I was constantly pushing several buttons at a time. In the winter (or cold mornings) this was a real nightmare because of the gloves. (I shoot landscapes). In the end, I don’t mind the size and weight of my current Nikon DSLR. I care about image quality and ergonomics (meaning that I can easily blindly operate my camera without issues). I sold the XT1 because of the ergonomics but also because it is expensive to run two different camera systems side by side. And I stayed in the DSLR camp which still gave me everything I’m looking for in a camera system. I’m looking forward to Nikon’s response to the mirrorless system. Mirrorless offer benefits, everyone is convinced about that. I just hope Nikon doesn’t make the same mistake as all other brands: get into mirrorless because of the “size and weight” misconception and because mirrorless is the new hype. I hope Nikon comes with a mirrorless system that will be groundbreaking and a leap forward in terms of image quality and ergonomics bundled with modern technology. From the information that has “leaked” so far, I’m confident they will do so. So I am looking forward to their answer and I hope Nikon will also have an option to use F mount lenses on the new system. That will make the shift from DSLR to mirrorless easier and less painful for many people. As you mentioned, there are over 100 million F mount lenses sold. That is a number even Nikon cannot ignore. Thanks for the comprehensive article, it was quite explicative. Personally, I don’t think DSLRs are going anywhere anytime soon, both because Nikon isn’t Sony, who was never a major player in the DSLR market – and who isn’t a small photography-centered company by any stretch of the imagination – and because at least for now DX is still what sells the most for Nikon and while I still think DX has no future whatsoever as a system I can’t envision Nikon pulling the plug on its profitability. Actually though, talking about the DX system, how do you think it’ll play out? The new Z mount makes sense for a FF sensor, many won’t particularly like having larger lenses on a mirrorless camera but it’s something that isn’t a deal breaker by any stretch. If Nikon decided to go mirrorless on the DX too, though? I have a much tougher time imagining an aps-c sensor and smaller body with a relatively humongous Z mount and lenses. Maybe Nikon could eventually keep the F mount on an aps-c mirrorless when/if it eventually decides to just drop DSLRs altogether. Something else I’m curious about is your statement about being unable to mount Canon EF lenses on this Z mount via adapters. Is there a specific reason why? One of the most notorious things about the Sony E mount of the new alpha series was that plenty of users mounted Canon glass on them via adapters (metabones et al.) and seeing that Sony’s E mount’s throat diametre is smaller than Canon EF’s, why wouldn’t it be possible to mount Canon glass on the Z mount exactly? Again, I’m quite ignorant about the whole subject, so I’d appreciate any explanation on it. Thanks again for the article and not too excessive coverage on the whole “hype train” Nikon created (and since you mentioned Nikon Rumours, I have also to add that it’s good to read what is an adult’s point of view on the matter, I’m a Nikon user but the sheer fanboyism on that website is more than I can stomach). Cheers! I think it’s a typo. It’s EOS M, not EF. I didn’t get why a larger mount would allow “more space for the sensor to move around”. Space in the body around the sensor allows it. I see only one thing, is the size of the projected circle, if sufficiently bigger than the sensor it allows better movement. But you do not know that size. This comes with a huge drawback : the efficiency of modern sensor pixel fall off drastically when that angle is getting bigger. This what happen to large aperture lens such f/1.4. So far the only response of camera maker was to cheat on the sensor gain (iso) when using large aperture (when the lens communicate with the body) to makes the user think he get the extra quantity of stop expected. I hope Nikon work on that and found a true physical solution. “the efficiency of modern sensor pixel fall off drastically when that angle is getting bigger”. That is an interesting point. Is that also true or a problem for BSI Sensors (CMOS) where the photocathode layer is directly on the surface? “They have a wider angular response” says wikipedia. I am not sure about BSI, but I suspect it can be wider. The “problem” is the micro lenses front of pixel which does a great job on focussing light into the active surface of pixel for ‘normal’ ray but not for coma rays. Also, if Nikon wants to move the sensor in extreme angles to do things like astro tracking, it will be possible with more space, don’t you agree? Sony’s IBIS is not particularly great (when compared to Olympus or X-H1) and I suspect it has to do a lot with lack of space. I hope Nikon can give us IBIS that will be as good as what I have seen on the X-H1. Nope Sly is correct. It is the image circle that matters, not the mount diameter. The quote from Fuji may have stuff lost in translation, but from the end results of Fuji adding IBIS to the X-H1, what the manager was likely talking about is how practically all of Fuji’s lenses were optimized for an image circle of IBIS-less APS-C (unlike other formats that share different sensor sizes on the same mount). That means few of their lenses project a larger image circle than APS-C, but does not necessarily mean the lens mount diameter was preventing a larger image circle (someone did test where they determined X-mount can support a sensor up to a 1.2x crop factor). The likely reason the 35mm f/1.4 is most effective with IBIS on the X-H1 is because it has the largest image circle. You can have a large mount diameter but design all your lenses to have an image circle that is exactly the size of the sensor (making IBIS impossible without losing quality). You can also have a small mount diameter but design all your lenses with a slightly larger image circle than the sensor to factor in IBIS. In the end of the day, it’s the image circle that matters. Nasim Mansurov, I tend to be agree with Jake JY at least to say that it is not that simple. The image circle matters. Maybe we can say : If you want a short flange distance (justify among other by the need to adapt some older lenses), you need a large mount to not only project the image on a FF sensor but also to allow the sensor to move for IBIS. PS: let me know if you want to use such material for other purpose, I still think it is a great way to show the effect on focal lens and sensor size to conserve a similar field of view. Good is Nikon F mount.. Else i will go pure Cano . Hello Yoda. Nice to see Star Wars characters visit Photography Life! What a honor for Nasim knowing that Photography Life is known throughout the universe. Name me one good reason to transition to Nikon Z. As a Nikon owner we all understand that the F system is no longer the future and will now be abandoned (Nikon can’t keep 2 mature FF offerings alive in such a devastating crisis of the entire commercial photography landscape). All intermediate adaptor based transitioning options will never deliver you the same quality as the native Z solution. Don’t also forget It has taken for both Sony & Fuji about 5 years to develop their mirrorless camera into a fluent working solution without disturbing design errors & bugs – and release a decent coverage of all focal lengths in their lens-range. Many that did do the jump in the early days regretted their initial investments pretty much and that won’t be different for Nikon (or Canon mirrorless). I think there are today too many photographers who followed the same path as I did: since Canon & Nikon didn’t move in the mirrorless corner, we partially bought into Sony or Fuji. First as a second lightweight solution, later it became our primary system. The last bits of my Nikon F gear are gathering dust on the shelf now and really wouldn’t know why I would ever be interested in a new adventure. On top of that – I wouldn’t have said this a few years ago, but there’s also a serious chance that over 5-10 years photography will be a 100% smartphone story and even Nikon Z will have become a dinosaur in this landscape. I’m sure we’ll all eat our hat about what will be coming in the next 10 years. In 2008 we wouldn’t have thought that even a Magnum photographer could shoot documentary pictures with an smartphone – well some have done today. I like people claiming that mirrorless cameras are less obtrusive while in reality, this is what’s happening more and more in journalism. You are still limited by the size. The small little lens hole on your smartphone allows a much smaller amount of light to go through than big lenses. So maybe in 10 years sport photographer will use cell phone bu behind big lenses to collect enough light for enough image quality while freezing action. Last time I checked, the F-mount had 10 lens contacts. Pete, I apologize for a late response! The lenses that have more than 8 contacts are typically those that are compatible with teleconverters (like the 70-200mm f/4 you referenced). Basically, the last 2 contacts are used exclusively for teleconverter communication. The Nikon DSLR cameras themselves don’t have more than 8 contacts. Where did you get the image of the Nikon Z? It’s not officially announced yet. If it’s not from Nikon then it would just be polite to credit the source. Anyway, I’m excited to see this in action. I’m really interested to see how they compare to the D850 and the Sony twins. Sean, we all have our sources, but I can tell you that ever since we published the image, many others have taken it from PL without permission. Thanks, this helps a lot. At first I thought maybe the larger throat was simply to accommodate the Z to F adapter while still providing the shorter mirrorless flange distance, but your summary adds a lot more to that. Excellent tutorial Nasim – thank you as always for keeping the factual content high and the drama low! I know you’ll be dissecting the new cameras in many ways as more specifics are released. You are one of the few “go-to” sources that will help me decide whether or not to buy into this innovative, but “first-generation” camera system. Most of the Nikon shooters I know (myself included) believe the smart play would be to wait for Nikon’s second, or third generation camera to ensure the bugs are worked-out, but we also know there will be certain benefits realized with the first cameras. Very excited about this and glad that Nikon has apparently taken this entry very seriously. James, thank you for your kind comment, we truly appreciate it! We are working hard on releasing many articles regarding the Nikon Z6 and Z7 cameras today. Hi, red your beautiful, and full of knowledge article. Thank you for all. There is couple rumors and caps about the z mounts’ inner diameter is 55mm. Although these are rumors, we will learn everything tomorrow. Thank you again. Ali, the 52mm number is the throat diameter, while 55mm is the mount diameter. Nazim I have just measured a Pentax mount, I have a old LX film camera with a K mount. inner diameter is 44.5mm and throat diameter is 48.5mm. Mike, that’s awesome, thank you so much! I have updated the table with that info. Actually, while updating the table I realized that the throat diameter cannot be 48.5mm. Did you mean 40.5mm? The inner diameter is the diameter of the mount without the hinges / claws. The throat diameter is the diameter of the mount with the hinges / claws. This means that the throat diameter should be smaller than the inner diameter. Thank you for another informative and helpful article. Do you know if Nikon will make an adaptor if we want to use a Nikon F mount lens with the new mirrorless rather than buy all new lenses? Hi Nasim, will be the adapter compatible also with Sigma lenses? I am considering 500/4 Sport and like to know if I will be able to use it with Z6 or Z7. Thank you (not only) for this article but just for the consistent quelity of PL website. Dusan, I don’t know if it will work specifically with the 500mm f/4 Sport, but I did try the 24-35mm f/2 Art on the Z7 and it worked just fine. This is a fascinating topic. A strategic view of these recent developments unfolding around the Z6 and Z7 suggest they are in fact Nikon’s trojan horse. There’s plenty of evidence how this twinned MILC launch has successfully whipped up the media: spreading a pandemic of Nikonitis! A well executed operation by Nikon, where trendy MILCs are delivering the Z Mount into the collective photographic psyche, with remarkably low negative backlash (against a brand new core innovation)! 49mm seems to be a major underestimate of the throat diameter. See Comments etc recent posts (3 August and then past 48hrs) on Nikon Rumours that estimate Throat-Diameter at 55-59mm using scaling ratios off available images. There are also threads debating this on DPR…. My latest comparisons of today’s leaked photos point to 54-55mm. Thus, the wide throat diameter also points to wider options of cross sensor designs, perhaps even 44x33mm (ie the MF “DX” of the ‘blad X1D). Clearly, we can expect the Z-Nikkor design space to be a vaster sphere of optical diversity across sensors. Potentially, Nikon will fulfill all genres’ needs. Exciting times Indeed!! Gosh1, I agree with you – this is a very strategic move by Nikon and it is going to make huge headlines today. Thanks Nasim, and further for your rational synopsis amidst far too much hyperbole (!) true to tradition of PL. The populating of my F-Nikkor battery owes a great deal to your reviews. Especially of telephotos and TCs. I’m most intrigued to test how excellent lenses (including my Micro-Nikkors, and 58 f1.4G) et al perform on a Nikon Z7. Already it seems this model makes the most sense. Well the official specs are Flange distance = 16mm; diameter of 55mm. The Z-mount has a 65% smaller flange and 17% larger diameter than the legacy F-mount. I guess my main concern will be how well the ZF adapter will work with non-Nikon lenses. I know that the Nikon 1 adapter allows only one focus point with F lenses, and I would be quite surprised if Nikon restricts F series lenses to just the one focus point with the ZF adapter. I am currently shooting with a D810 and D750, so I know that I will not be an early adapter/switcher. I might add a third body (the 24 MP one), sometime in the future, however only if that adapter works with non-Nikon lenses. I am happy to see, if the information is correct, that the ZF adapter will be included with a Z body purchase. Sir, I would expect that once you get a model or two in hand, you will test with non-Nikon lenses. We will all be waiting for your professional evaluation. Now to take a nap and be ready for the “official” release later tonight. I always wonder what would be the technical reason limiting FT-1 one focus point (whether is lack of processing power of original Expeed4A used in V1/J1, optical limitation to get consistent AF results, …etc) I don’t believe it’s done purposely to cripple the system. There must be a technical reason for it but at this point it’s kind of moot. The throat size is 55mm according to the Nikon website…. Are you sure the Z mount is 52mm? I’m seeing other sources citing 55mm. 52mm is the throat diameter – Nikon has been advertising 55mm, which is the inner mount diameter. Those two things are similar, but not quite the same. The four thin metal tabs you can see in the Z-mount take off a total of 3mm. Fck mirrorless, I’m using F & D Nikon systems, have plenty of Nikkor F lens. I don’t see any reason to convert to Z. In the mount dimensions table above, the Cannon EF/RF mounts are listed as a throat diameter of 50.6mm, but, in the note below that the EF is referenced as 50.4mm. Which is the correct number? Sorry, it is 50.6mm, as referenced in the table. Measured it a few days back. One drawback to having the largest throat size is that third-party lenses will not be optimized for this as they are probably designing for the least common denominator aka the smallest throat size. It will be some time (if ever) before we see a non-Nikon lens that takes advantage of this.